Their results show that it's possible to take a plant that's practically wild and bring it close to domestication in a matter of years. The team describes their work, a shortcut around traditional breeding techniques, October 1, 2018, in the journal Nature Plants. "I firmly believe that with the right approach, the groundcherry could become a major berry crop," says Lippman, a plant scientist at Cold Spring Harbor Laboratory. Some scientists might consider the idea a reach, he adds. "But I think we're now at a place where the technology allows us to reach." For growers, new crops mean a chance to diversify and offer more options to consumers. The next major berry has eluded food producers for years, Lippman says. Groundcherries are appealing candidates because they are drought tolerant and have an enticing flavor. You have to taste the fruit to fully grasp its complexity, says Lippman, who describes it as tropical yet sour, sometimes with hints of vanilla. 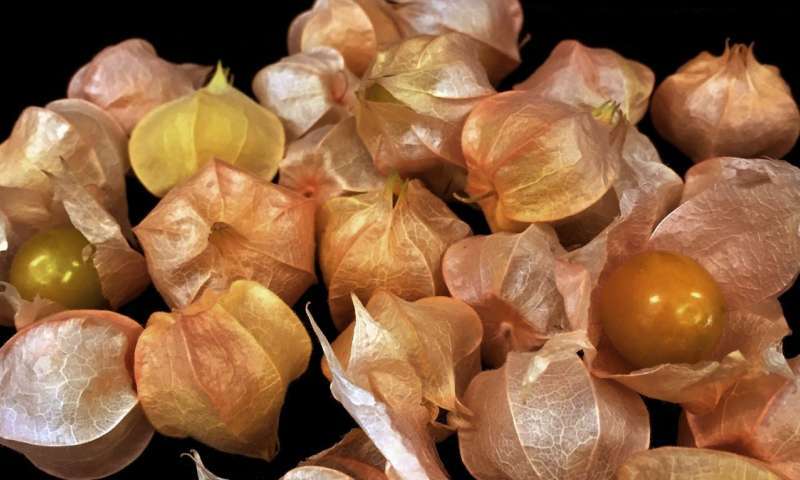 Groundcherries (also called "husk cherries" and "strawberry tomatoes") are native to Central and South America and belong to a group of plants known as orphan crops. They're grown as small-scale crops, regionally, or for subsistence. Orphan crops rarely make it into mainstream agriculture because of limitations such as poor shelf life or low productivity. Improving these plants for large-scale production through breeding is a huge investment of time and money, Lippman says. It can take anywhere from a decade to thousands of years to domesticate a crop from the wild. Researchers and growers need to figure out the plant's genetics, adaptations, and how to cultivate it. That's why few orphan crops become household names. Quinoa, the fluffy, high-protein grain that's now standard in supermarkets, has risen through the agricultural ranks, but other orphan crops like groundnut, teff, and cowpea remain relatively unheard of outside their home regions. Some consumers may be already be familiar with the groundcherry—like its relative, the tomatillo, the orange fruits are covered in thin, papery husks. They occasionally show up in U.S. farmers markets where "they sell like hotcakes," Lippman says. (Martha Stewart has a recipe that suggests drizzling them with olive oil). But groundcherries are not easy to grow. Now, Lippman thinks that the traits he and Van Eck have introduced may position the fruit for large-scale production. 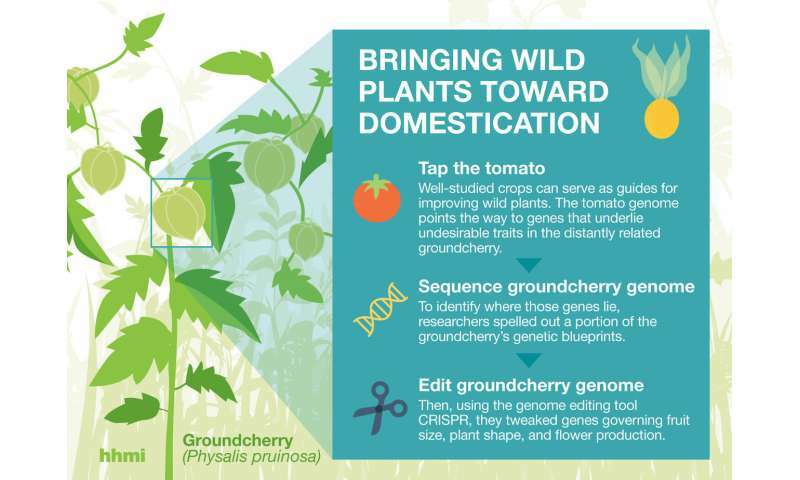 The researchers' work lays out how genome editing can give orphan crops like the groundcherry an agricultural advantage. Scientists currently use genome editing to engineer desirable traits in mainstream crops like corn, soybeans, and many others. But until now, no one had used the technique to bolster desirable traits in orphan crops. To ready the groundcherry for store shelves, Lippman and Van Eck needed to address some of the plant's shortcomings. The researchers wanted to make its weedy shape more compact, its fruits larger, and its flowers more prolific. 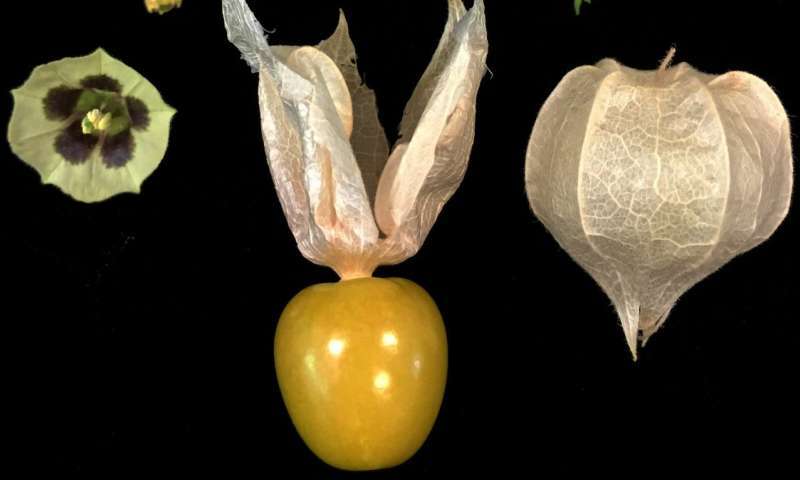 They used a three-pronged approach to tackle the problem: the team sequenced a sampling of the groundcherry's genome, figured out how to use the genome editing tool CRISPR in the plant, and identified the genes underlying the groundcherry's undesirable traits. Next, Lippman wants to fine-tune the groundcherry traits they have begun to improve and manipulate additional characteristics like fruit color and flavor. He notes that some traditional plant breeding will still be necessary to perfect the groundcherry as a mainstream crop. And he can't say exactly when the fruit might make it to market. Releasing a new variety will first require navigating CRISPR intellectual property rights. Lippman hopes his team's work will inspire researchers to examine other orphan crops with well-studied relatives and consider how those crops, too, have potential for rapid domestication. "This is about demonstrating what's now possible," he says. What country is that, RaDZ? And like tomatoes, are you deleting the taste for long shelf life? I'd look forward to trying it, but where will it be on sale? Whole Foods, etc. hates GMO products, and even ordinary supermarkets are all into the organic, touchy-feely stuff. If these did go on display in a supermarket, you might see protesters with picket signs looking to have them segregated away from other produce by a glass bubble! I grew up in North Dakota and we always grew Ground Cherries. I have also seen them referred to as Golden Husk Tomatoes. They have a ton of seeds in them. The one good thing about that, is once you raise them, you pretty much always have them unless you kill them off. I have found that you either love them or you hate them. I love them. I grow them in pots these days on our deck in Pennsylvania. A couple of years ago, I found them as starter plants at a local farmers market. I have seen the harvested berries once in a grocery store about 15 years ago in Connecticut. I only saw them there once. I think they were too expensive and didn't sell well. My favorite way to eat them is warm right off the plant. The best ripeness is when you touch the husk and it falls off into your hand. They can get too sweet if they get really ripe. Years ago I was also able to purchase seeds online. rareseeds is a place that sells them. And consumers just don't want GMO food. Period. Breed them the conventional way and you might have something. This closely resembles a crop we have in Hawai'i, that we call "poha." It's been in the islands since the early 19th C.
Physalia peruviana, sometimes called "Cape Gooseberry." Assuming it's a close relative -- I can see the urge to make changes. The yields are highly variable. Being a GMO food, how will it be tested to determine human health effects? Not that it really matters to the commercial interests. Stop dicking around with plants. Learn to eat them as they are and enjoy them. Plants that are wild or closer to wild are hardier (without chemicals) and almost always contain way more useful nutrition and minerals. Physalis have been around for a long time, grow in lots of gardens in the Med etc. They are never going to be as popular as strawberries, but make a nice garnish on a dessert. And consumers just don't want GMO food. Sufficiently many do want GMO alongside the ten or so older genome modification methods - including artificial selection which we have done for thousands of years - and facing global warming and population increase we don't have any reason not to use the most productive, safest methods. *) CRISPR are, like all genetic changes, risky for individuals however. That is why 80 % of fetuses are aborted, say. ... and starve, and unnecessarily destroy the environment, instead. No, thanks. And we have 10 kyrs (100 kyrs if we include our self selection) of history that agrarian methods work splendidly. groundcherries are not easy to grow. Really? In the Andes the aguaymanto is essentially a weed. I don't know anyone who grows them, but there are still plenty of them available to eat. I've seen them for sale here in Seattle for $20/pound. Not bad for a weed. Eat it and we'll see happens.